Tessa Longbons | March 2, 2018. Alaska’s 2017 annual abortion report was published by the Alaska Department of Health and Social Services in February 2018. With this 17-page report, Alaska is the first state to release its complete 2017 abortion data, just weeks into the new year. There were 1,255 abortions performed in Alaska in 2017, similar to the 1,260 performed in the state the year before (Figure 1). Since 2003, Alaska’s earliest abortion reporting year, abortion totals have declined by 31 percent. 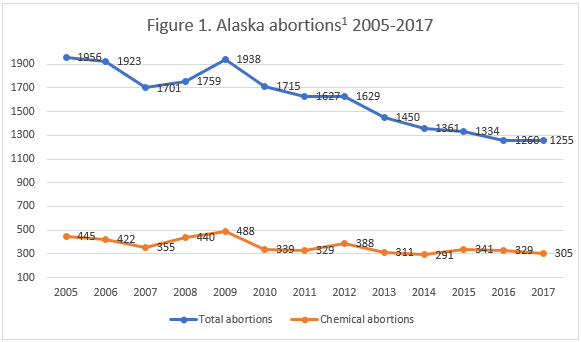 Twenty-four percent of the abortions performed in Alaska in 2017, that is, 305 abortions, were chemical. Chemical abortions fell by seven percent from the previous year and by nine percent from 2003. 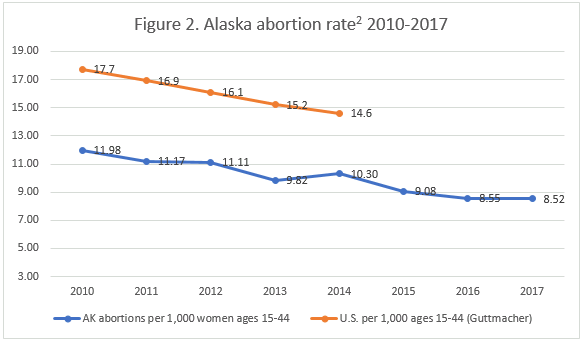 Alaska does not report the state abortion rate, but the Charlotte Lozier Institute (CLI) estimates that the state’s rate of 8.52 abortions per 1,000 women of childbearing age has declined slightly from 2016 (Figure 2). Nearly all the women getting abortions in Alaska during 2017 – 99 percent – were Alaska residents. White women were in the majority at 58 percent of abortions, although some minorities were over-represented: American Indian/Alaska Native women underwent 22 percent of abortions, even though they make up only 18 percent of the state’s population of women ages 15 to 44, and black women underwent eight percent of abortions while making up just five percent of women of childbearing age. Slightly over half of the women were in their twenties, 55 percent. Not quite a third were in their thirties and 11 percent were age 19 or younger, including seven girls under the age of 15. Only three percent, 36 women, were age 40 or older. Almost 84 percent of women had completed 12 or more years of education, with 43 percent having finished 12 years and 41 percent having finished 13 or more. Seventy-five percent were unmarried. A majority of women had previously given birth; 21 percent had one previous live birth and 37 percent had two or more. A total of 775 women, 62 percent, had never had an abortion before, while 25 percent reported having one prior abortion and 14 percent had two or more. Sixty-two percent of the abortions performed in Alaska during 2017, or 784 abortions, occurred at eight weeks gestation or earlier. Of these, 16 occurred between one and four weeks. Twenty-nine percent of abortions were performed between nine and 12 weeks, and eight percent between 13 and 16 weeks. No abortions were reported after 16 weeks gestation, although in Alaska there are no limits on how late in pregnancy an abortion may be performed. However, the gestational age of one abortion was not stated. According to Alaska’s abortion report, 95 percent of the women getting abortions did not request the state’s informed consent material, although 14 percent had the material provided to them. Alaska does not provide a comprehensive list of women’s reasons for abortion, but the report indicates that one abortion was performed because of a congenital anomaly. Alaska’s 2016 abortion report revealed that after the state expanded Medicaid in 2015, the percentage of publicly-funded abortions increased from 33 percent to 44 percent. During 2017, that number continued to grow. In 2017, some 51 percent of abortions were funded by state Medicaid dollars, compared to 44 percent the year before – a difference of 79 more abortions funded by taxpayers. CLI associate scholar Dr. Michael New predicted in 2015 that by expanding Medicaid, Alaska would expand abortion, and the state’s recent abortion reports indicate those concerns were warranted. At the same time, pro-life Alaskans have watched their health insurance options steadily shrink. In 2016, more than three-quarters of the individual and family insurance plans on Alaska’s health exchange covered elective abortion. By 2017, life-protecting plan choices had fallen to zero—the five plans offered on Alaska’s exchange all covered abortion. Alaska is among the quickest states to publish abortion statistics—out of the 46 states that release abortion reports to the public, Alaska is the first to publish its full 2017 report. However, while timely, the report is not as comprehensive as other states’. A survey of state abortion reporting by the Charlotte Lozier Institute ranked Alaska’s reports at 21st best out of the 50 states, the District of Columbia, and New York City. Alaska could improve its reporting by including data on complications resulting from abortion. Some discrepancies in the total number of abortions reported year to year should also be clarified (see note 1 below). Lastly, the state could be more specific about why women choose abortion and where these abortions take place, as some states already report. With Alaska’s Medicaid expansion continuing to affect abortion trends in the state, information on where and why women get abortions is increasingly relevant. Alaska does not report the state abortion rate. Rates were calculated by the Charlotte Lozier Institute using population estimates from the United States Census Bureau. The rates were calculated using the following formula: (total number of abortions performed in Alaska ÷ number of resident women ages 15-44) x 1,000. To calculate the rates, abortion totals for 2013 through 2017 were taken from the 2017 report and abortion totals for 2010 through 2012 were taken from the 2014 report.